Should You Recycle Metal in Evergreen Park? Perhaps you’ve got a bunch of old electronics laying around? Maybe you’ve got a bunch of aluminum trays which you don’t use anymore? In any case, you’ve got metal items which can be recycled. The question is: should you recycle these items? Should you recycle metal in Chicago? 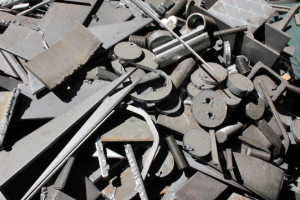 There are quite a few benefits to recycling metal, all of which can be read about below. The simple fact of the matter is that recycling metal helps the environment. Exactly how does it help the environment? Let’s discuss. Fewer things are more detrimental to our environment than carbon (greenhouse gas) emissions. These gases are emitted whenever fossil fuels are burned, and they have been pegged as one of the primary contributors to climate change. While recycling metal won’t eliminate carbon emissions entirely, it will help to reduce total emissions because it is more environmentally-friendly to recycle metal than it is to mine it. Because the existence of recycled metal eliminates the need to mine new metal, recycling metal helps to substantially cut back on energy usage. While both recycling metal and mining new metal necessitate the use of gas and electricity, recycling metal doesn’t require anywhere near the same amount of energy to be used. In essence, metal recycling helps to take pressure off of the power grid, and to preserve existing fossil fuels. This has significant positive implications for the environment. While the vast majority of the metal ore in the world is still in the ground, it won’t stay that way unless metal recycling is prioritized. The fact of the matter is that metal is a finite resource—it will, at some point, run out. Using metal over and over again allows us to preserve our rich metal mines. As long as we have a surplus of metal in the waiting, the prices of metal will remain relatively low. Therefore, this is not just an environmental issue, but an economic one as well. When most people think of recycling, they think of the environmental benefits. While there are plenty of environmental benefits to recycling metal, environmental benefits aren’t the only kind of benefits. There are also economic benefits associated with recycling metal. Read about them below. Did you know that the United States recycling industry is responsible for the creation of millions of jobs? Hundreds of thousands of those jobs exist in the metal recycling industry, specifically. As one of the biggest industries in all of the country, metal recycling is vitally important to the United States economy. In fact, it has been found that the metal recycling industry contributes hundreds of billions of dollars to the United States economy on a yearly basis. Recycling is not only good for the environment, it is also good for the United States work force. Think prices on metal products are expensive now? If so, you should be thanking your lucky stars that metal recycling exists. If manufacturers always used fresh metal instead of recycled metal, the prices of cars, appliances, etc., would be considerably more expensive. Want to keep prices down as low as possible? You can do your part by recycling metal materials. Looking to Recycle Metal in Evergreen Park? Do you have metal products which you’re trying to recycle? Looking to recycle metal in Evergreen Park? If so, we here at Central Metal Recycling have you covered. We accept and recycle all different types of metals, from iron, to brass, to e-scrap, to steel, and more. Our seasoned recycling specialists are ready to assist you.